I am thoroughly enjoying Richard Dawkins' new book The Greatest Show on Earth. This is perfect science writing for someone like me. I'm learning a lot, but the book is a pleasure--not the least bit like doing more work at the end of the day. The title is apt--in fact, I feel like I'm at a show. The marvels of nature are being paraded before me, and they truly are marvelous. But now, what's this? A paragraph that isn't actually crystal clear (p. 92). When we look at a solid lump of iron or rock, we are 'really' looking at what is almost entirely empty space. It looks and feels solid and opaque because our sensory systems and brains find it convenient to treat it as solid and opaque. 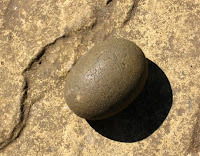 It is convenient for the brain to represent a rock as solid because we can't walk through it. 'Solid' is our way of experiencing things that we can't walk through or fall through, because of the electromagnetic forces between atoms. 'Opaque' is the experience we have when light bounces off the surface of an object, and none of it goes through. If the rock is mostly empty space, why do we see the particles, not the empty space? Well...good question! It doesn't seem as if Dawkins is explaining this well. Surely it's not just convenient to represent the rock as solid, but actually impossible to see that empty space. But...why? If we can see the particles, why can't we see the empty space? I bet some smart person out there can improve on Dawkins' explanation. I'm not sure I understand the question. The room I am sitting in is "filled with space." Or rather, it appears to the naked eye as though the room is a "space" with furniture and other items in it. I guess I'm not clear what "seeing" and "space" mean in this context. Or is that your question? This is complicated, because there aren't really "electromagnetic forces between atoms" either. That is, even our more exact scientific descriptions are metaphors or are maps of sorts. There isn't a real solid rock, but there aren't particles either. The question is about the "solid lump of iron or rock" (see picture). If it is "almost entirely empty space" why do we see it as solid? That's Dawkins' question. I like the question, but find his answer less than satisfying. What we experience when we experience the rock, is not actually what reality is, but how our minds represent reality. We know the rock is mostly empty space, just like we know that a dog whistle makes noise when you blow into it, however we experience no empty space when we see it, and we experience no sound when we blow into the whistle. Why? Because that is how our minds represent the sensory experiences its receiving. When watching and listening to the video, most people hear DA DA DA. But if you don't watch the video and just listen to the video, you hear BA BA BA. This shows that the mind is representing reality differently when we experience it under different conditions. I'm attempting to get my father, who is a theoretical physicist, to chip in here. I'm interested to seeing what answer will statisfy you. I think that Dawkin's use of "" around "really" and "opaque" and so forth is interesting. I mean: is it "really" NOT "opaque?" What would that even mean? What we see is the result of light that reflects off of objects (rocks or particles makes no difference). Light doesn't reflect off of nothing so we don't see things that do not reflect light except as an absence of light. We don't even see particles. We see a splotch of color aranged such and so. If we reach out and touch it we get a sensation: "cool and rough or smooth." We then, through conditioning and training, attach words to these events, these events caused by interactions of "things", and the words themselves, and everything associated with them are also caused by and cause other events. I do find these discussions interesting. Why is it "really" "this" rather than "that?" What gives anything a "true" ontology? the space that we're talking about here would be too small for light to pass through, otherwise we would be able to see the object "glow" when we held it up to the light like when we hold paper up to a light. That or its too layered.... Actually that would probably be the better answer. If we cut very thin strips of rock we can actually transmit light through it. I don't think that my answer above is so off track. We see a solid object, not the empty spaces, for obvious evolutionary reasons: we need to avoid big rocks to survive. However, above I was saying, as does Faust, that there is no way that we can see the rock as it really is, if it even makes sense to talk about the rock as it really is. The scientist's view of the rock, molecules with empty spaces, is no "realer" than my naive view. Alright, I said I would ask my father, who is a physicist, and here's what he said. First, light can't get into the empty spaces within atoms. It's apparently a tight squeeze in there. We can't see what doesn't get illuminated. Second, it's like what Wayne said--there are layers. So even if the rock is mostly empty space, the atoms are arranged in such a way that photons are always running into particles to bounce off of. Thus, the opaque, solid appearance. I asked him what he thought of Dawkins' business about the brain "finding it convenient" to represent a rock as solid...and he said no, it's just a question of the material the rock is made of and the basic facts about light. OK, he's my father, so of course he's right. As is probably obvious, I inherited that characteristic of always being right. Faust--I think it's a good question what makes an explanation adequate. When are you done? Amos--It seems to me that some things about the way we experience the world are just due to the physical facts about the world. We may have no need to know about the empty spaces within atoms, but that's not why we can't see them. As to whether scientists' views about rocks are more true...well, we all certainly think so when we're choosing someone to design a bridge or an airplane. I never used the word "true". I said that the view of scientists (or of engineers in the case of building bridges) is no closer to reality than my naive view. It may be more exact; it may be more accurate. If more exact and more accurate mean "true" to you, then the scientists' view is truer. Now, before you jump on me, yes, I can make mistakes as can a scientist: I can mistake a rock for a tree trunk: in that case, my affirmation is not true. Let's say that my naive view is part of another language game than that of the scientist, but in my opinion, neither game brings us closer to reality. Perhaps God sees rocks as they really are.